“The day before the clashes started, 15-year-old Hassan’s grandfather took him from their village on Basilan Island in the southern Philippines to attend what his grandfather described as a “peace rally” in nearby Zamboanga City. Three days later, I encountered Hassan in a cramped Zamboanga jail cell along with young men arrested for being alleged members of the Moro National Liberation Front (MNLF). 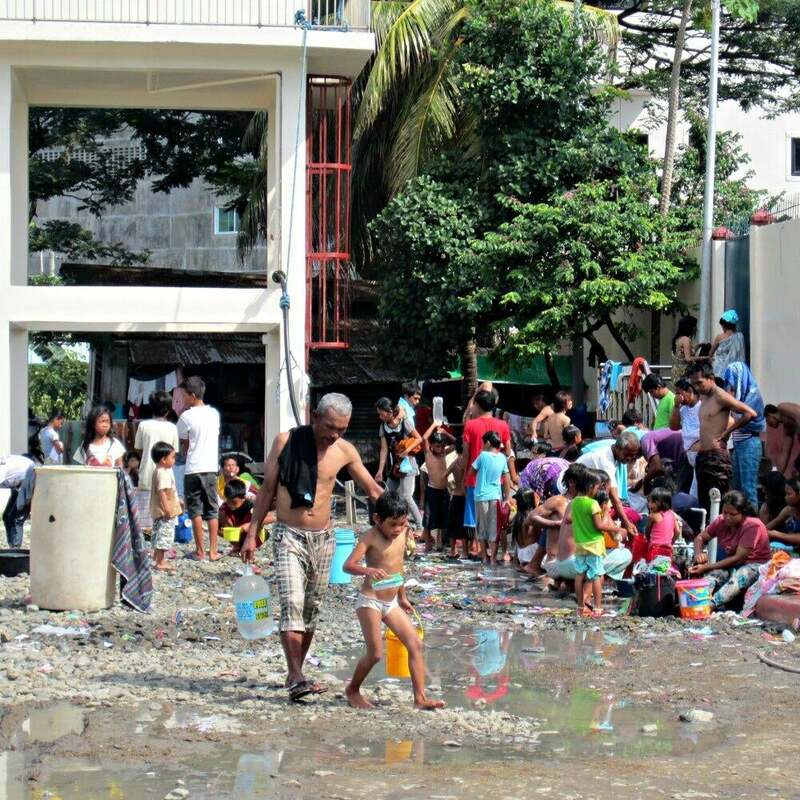 Although sanitation is being addressed, many displaced residents in Zamboanga’s stadium use this common bathing area. The toll from the fighting between the Muslim rebels and government forces, which began on September 9, includes dozens killed and wounded, 10,000 houses burned, and 120,000 residents displaced. Many civilians are still being held hostage by the rebels. But children, like Hassan, pay their own steep price. Hassan denies that he’s a child combatant for the MNLF and the authorities have since relocated him to a youth detention center. Other alleged child soldiers include Kiram, 14, and Abdul, 17, who had spent five days in police custody when I met them on Wednesday, handcuffed to three adults inside a police station. Human Rights Watch has previously reported on incidents in which the Philippines armed forces have falsely identified children as “child warriors” and paraded them before the media. But even if Hassan, Kiram, and Abdul really are child combatants, they’re victims. According to the Optional Protocol to the Convention on the Rights of the Child on the Involvement of Children in Armed Conflict, armed groups such as the MNLF should not, under any circumstance, recruit or use in hostilities anyone under the age of 18. The conditions of these children’s detention – that they’re sharing facilities with adults – also violate the government’s obligations under the Convention on the Rights of the Child, which the Philippines ratified in 1990. If these children have indeed been used in the fighting by the MNLF, they are entitled to psychological services and assistance in social reintegration. Over the past week, Human Rights Watch has also documented the rebels’ use of children as hostages and human shields, some of whom have been killed and wounded during military operations. Meanwhile, Zamboanga’s evacuation centers, including a sports stadium, overflow with thousands of children who are homeless and unable to go to school.